Get started quickly using AWS with the AWS SDK for .NET. 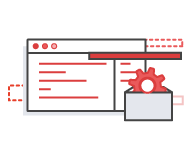 The SDK helps take the complexity out of coding by providing .NET APIs for AWS services including Amazon S3, Amazon EC2, Amazon DynamoDB and more. The SDK can be downloaded from NuGet or installed using the MSI package, which also includes the AWS Toolkit for Microsoft Visual Studio 2013 and 2015 editions and the AWS Tools for Windows PowerShell. The AWS SDK for .NET is now distributed as multiple service-specific packages on NuGet. Example package names include AWSSDK.EC2, AWSSDK.S3, and AWSSDK.DynamoDB. Each of these depends on the AWSSDK.Core, which will automatically be installed in your project if you reference any of the service packages in the NuGet Package Manager. NuGet is the recommended way to install AWS SDK for .NET packages. NuGet Package Manager will install the correct assemblies for your project type - .NET 3.5, 4.5, or Portable Class Library. If you prefer to use the MSI installer, you can download it by clicking the above button. The installer also includes the AWS Toolkit for Visual Studio and AWS Tools for Windows PowerShell. The installer includes assemblies for .NET 3.5 and 4.5. .NET Core support enables development of serverless C# applications using AWS Lambda and Amazon API Gateway using the asynchronous programming model for .NET standard 1.3 and above. 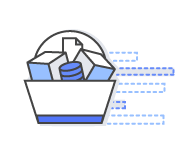 Through a simple API, the Amazon S3 TransferUtility achieves enhanced throughput, performance, and reliability by making extensive use of multi-threaded Amazon S3 multipart uploads. The AmazonS3EncryptionClient will encrypt data on the client before uploading to Amazon S3, and decrypt it when retrieved. Both functions use your own master encryption key that is stored locally. The Object Persistence Framework eliminates the need for application-level data conversions and custom middle-ware solutions by mapping .NET classes to Amazon DB items to store and retrieve data. The Glacier ArchiveTransferManager, through a high level API, eases transferring data to and from Amazon Glacier by automatically dividing large files into parts and computing check sums. The AWS SDK for .NET comes with assemblies built not only for .NET 3.5 and .NET 4.5 Frameworks, but also as Portable Class Libraries for use in mobile .NET projects. The SDK is built and tested on environments including Windows Store, Windows Phone 8.1, and Xamarin on iOS and Android. Simply add the desired NuGet packages to your project references to get started. Remove the session state scale bottleneck by easily storing ASP.NET session state in DynamoDB.